The cloud-based content creation platform Ceros announced version 6.0 of its Ceros Studio platform at an event in New York City Thursday evening. Ceros Studio is used by marketers and editorial outlets to create interactive, cloud-based content. The company’s clients include Vice, United Airlines, Condé Nast, McKinsey, and the Dallas Cowboys. The company raised $14 million in a series C funding round earlier this year; it has raised more than $30 million since launching in 2013. The updated studio product will include adaptive layouts, image editing, expanded animations, offline viewing and a desktop application. It also includes a full integration with Getty Images, bringing thousands of videos and photos to users of the service. 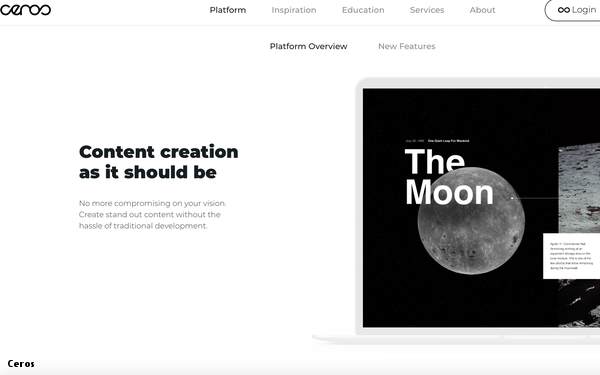 The company will update its education and inspiration products, which help users create better and more tailored content, as well as expanded editorial content produced under the Ceros Originals brand. Ceros cofounder-CEO Simon Berg told attendees the company’s goal was to bridge the divide between the physical world and the digital content world by enabling marketers to create digital content as engaging as offline experiences can be. The company used its event, which it dubbed “Experience Matters,” to create multiple “experiences” underscoring the difference between engaging content and poor-quality content. Attendees entered the event either on a red carpet (the “good entrance”), with champagne being poured into their glasses, or through a kitchen (the “bad entrance”), with drinks placed on a folding table in red plastic cups. The company also created a faux DMV at the event, representing the “Department of Mediocre Content,” as well as a sleek nightclub, which represented high-quality content.